Puisque l’aube grandit (Since Dawn Awoke) is the fourth song Diepenbrock wrote on a text by Paul Verlaine. The poem is from the collection La bonne chanson (The Good Song) that had been given to Diepenbrock, together with eight other Verlaine editions, by his friend W.G. Hondius van den Broek on 19 June 1908. The composer did not mention in his correspondence why he chose this specific poem. The only thing he wrote was: It is a peculiar poem […] but its opening words are so beautiful. (BD VI:128) Presumably Diepenbrock – who was frequently troubled by doubts and melancholic feelings himself – was attracted by the cheerful vitality and optimism the text expresses. At the break of day Verlaine ruefully bans all dire thoughts and dispels his bad dreams. From now on, together with a new lover who has brought light and clarity, he wants to follow a straight path through life, without being hindered by obstacles and setbacks. Diepenbrock turned Verlaine’s grand verses of twelve and thirteen syllables into a captivating song with long climaxes, great dynamic nuances and a frequent use of punctuated rhythms. Diepenbrock’s setting of the strophe in which the poet puts an end to his vindictive aggression and renounces the search for oblivion in drinking sprees, is remarkably strong, not in the least because of the independence of the piano part with a contrary rhythm in the bass. The changes of key in this song are functional. In the fourth strophe, in which the reason for the drastic transformation is given (“Car je veux, maintenant q’un Être de lumière” – For it is my wish now that a Being of light), the key of A-flat major forms a strong contrast to the preceding key of A major, as well as to the following key of D major, the main key of the song. Amidst chord progressions based on the circle of fifths, there are two thirds relationships here, resulting in the succession of A-flat, E6, A with added sixth, D9, G, E-flat6, a-flat minor with added sixth, D-flat9, G-flat, g half diminished. 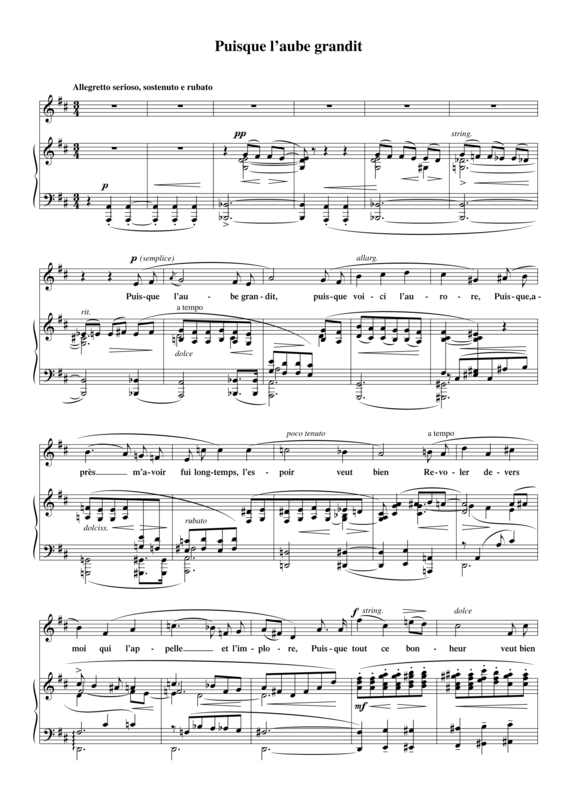 Meanwhile, like so often in Diepenbrock’s songs, the piano ‘sings’ a melody of its own. The septuplet that is used, is characteristic of the rhythmic flexibility Diepenbrock aimed for in his complete oeuvre. On 5 October 1910 the song was published by A.A. Noske, together with Diepenbrock’s Recueillement (Contemplation, RC 79) and Der Abend (The Evening, RC 90). Zalsman was one of the people to receive a presentation copy from Diepenbrock. He regularly sang the work at song recitals. The Hungarian alto/mezzo-soprano Ilona Durigo (1881-1943) played an important role in the performance history of Puisque l’aube grandit. On 14 October 1911 she premiered Die Nacht (The Night, RC 106) under Willem Mengelberg. At the matinee the following day the piece was played again, this time conducted by Evert Cornelis (1884-1931). That evening Durigo sang Mandoline and Puisque l’aube grandit prima vista, accompanied by Diepenbrock at the composer’s home. She really impressed Diepenbrock, especially with the latter song: She sings that song with an incredible passion, and carries me away so much that I play it very well, something I am not capable of otherwise either. Durigo included both songs in her repertory. In July 1916 Diepenbrock orchestrated Puisque l’aube grandit (see RC 130). The evil dreams, be they forever gone. The cruel words my spirit dwelt upon. Forgetfulness found in the fateful glass! When rocks and gravel strew the beaten roads. Nor fearing aught, with Her close at my side. To shorten the rough road they will suffice. And truly this will be my Paradise. 23 nov 1909: Eerste uitvoering van Mandoline en Puisque l'aube grandit door Julie Hekking en Evert Cornelis in de Kleine Zaal van het Concertgebouw. Voorts worden uitgevoerd Écoutez la chanson bien douce en liederen van Fauré, Chausson, Duparc, Franck, Debussy, Chabrier, Bruneau en een aantal volksliederen. De drie liederen van Diepenbrock vormen het laatste nummer voor de pauze. O, ware ik dichter, vlug improviseerend dichter, gelijk die bestonden in de historie der in liefde bloeiende Kamers van rhetorica of in levensbe­schrijvingen van Da Costa of Willem de Clercq of Laurillard, die in fraaie reeksen rijmende verzen op slag zeggen konden, wat hun uit 't hart, althans van de tong moest – ik zou al de woorden bezigen die me nu invallen, Fransch gekleurde (want we hadden 'n avond vol Fransche liederen!) deli­caat en charmant, languissant en puur, apart, subtiel en mysterieus, harmo­nieus, exquis, populair, rose, extast... Die zouden, in gelid gezet, 'n eleganten aanval moeten doen op mevrouw Julie Hekking, om haar te bewegen toch vooral niet mooie zinnetjes te verlangen in ruil voor haar urenlang bekoren met de gratie harer verschijning, de expressie harer weemoedsoogen, de suggestieve kracht van haar breeden lach, en met haar zangtoon, zoo levend, zoo diep en week soms, en zoo ver... Haar eigen, allereigenste zangvoordracht, in de schoonste poëzieën, waar geen klank, geen klankkleurtje van te loor ging voor onze brave Hollandsche ooren. — Namen van dichters kan ik u noemen: Paul Verlaine, Leconte de Lisle, Baudelaire, Reboul, Rostand, Catulle Mendès. Namen van toondichters met hen: Fauré, Diepenbrock, Chausson, Duparc, Franck, Debussy, Chabrier, Bru­neau... Maar wat 't interessantst of 't innigst, 't onbeduidendst of wonder­baarlijkst van inspiratie en vinding ons scheen, en wat mevrouw Hekking, die een artieste is van echt bloed en onbesmet Fransch karakter, 't zorg­zaamst groeien en bloeien deed, in dezen kunstvol aangelegden tuin; of waar zij minder sterk was in haar beelding, waar 't geestigst – ik kan 't u niet zoo maar omschrijven, noch 'n indruk u ervan geven in de taal, passend bij de verfijnde uitingen van het moderne lied!